It should be noted that North Dakota is among the lightest of racing states, with but 14 days of live racing in 2016. Posted in Annual Kill Reports, North Dakota. Someone take a look at Ride In The Park 1st Mahoning Valley 1/30/17 108 starts..
Ride In The Park, like so many others, has been reduced to a wagering profit slave because there’s no way this gelding should be running. His last 8 starts are nothing more than a public display of animal cruelty. He finished in the last 3 for most of his 10 starts. This dude needs to be retired, but to where? He will most likely end up at a kill auction eventually, but might be one of the lucky ones. What a rotten business this is. 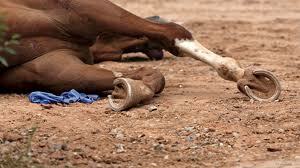 Nobody is protecting the Ride In The Park racehorses as they are continually recycled into another bin (horse race). The more recycled they are the more the abuse escalates because they are, most likely, running on a multitude of sore limbs. He’s now just a number generating wagering revenue and this business is just fine with that. He’s an accident waiting to happen – will he make it out alive?